Site Content and Structure page is one of the useful tools for SharePoint administrators to manage both the content and structure of SharePoint site collection. 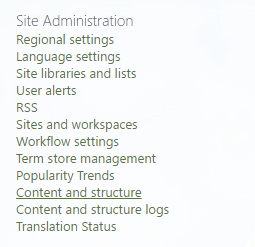 In older versions of SharePoint, a menu item called “Manage Site Content and Structure” is available under “Site Actions”. But this may not be the case in SharePoint Online, SharePoint 2013, SharePoint 2016 or later, where the Site Actions menu has been removed, and “Manage Site Content and Structure” option appears to be missing. To enable the access to the Site Content and Structure config item, the prerequisite is the SharePoint Server Publishing Infrastructure site collection feature. Site Content and Structure page is available only when SharePoint Server Publishing Infrastructure is an activated site collection feature. 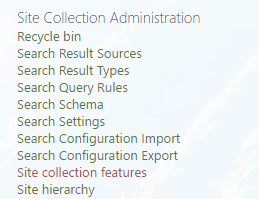 To enable SharePoint Server Publishing Infrastructure feature, go to Site Settings (accessible via Gear icon) and click or tap on Site collection features under “Site Collection Administration”. Locate SharePoint Server Publishing Infrastructure, and hit the Activate button at the end of the row. When activated, the Activate button will change to Deactivate, with the Active label appended to SharePoint Server Publishing Infrastructure. If you encounter the error, it’s possibly you’re trying to activate “SharePoint Server Publishing” feature under “Manage site features” in “Site Actions”. Note that SharePoint Server Publishing is not SharePoint Server Publishing Infrastructure, and is not required to manage site content and structure. The Site scoped feature being activated has a dependency on hidden Site scoped feature ‘FeatureDefinition/15/22a9ef51-737b-4ff2-9346-694633fe4416′ (ID: ’22a9ef51-737b-4ff2-9346-694633fe4416’). Hidden features cannot be auto-activated across scopes. There may be one or more visible Site scoped features that auto-activate the dependent hidden feature. The Site scoped feature being activated has a dependency on hidden Site scoped feature ‘FeatureDefinition/15/dffaae84-60ee-413a-9600-1cf431cf0560’ (ID: ‘dffaae84-60ee-413a-9600-1cf431cf0560’). Hidden features cannot be auto-activated across scopes. There may be one or more visible Site scoped features that auto-activate the dependent hidden feature. Once SharePoint Server Publishing Infrastructure is enabled, access Site Content and Structure page from Site Settings -> Content and Structure option under Site Administration. Replace <sharepoint-domain.name> with actual domain name that corporate used to access SharePoint.